What is it? If you think of beets as just some goopy food plopped out of a can at Thanksgiving, you might want to get to know beets a bit better. A beet is a three-in-one wonder vegetable: You can eat the green leaves, the stalk, and the recognizable knob-shaped beetroot - not a bit need go to waste! Though the deep reddish-violet variety of beets is most common, they also come in white, gold, and other colours. Cultivated for use in soups (Russian borscht, for instance), salads, or as a natural sugar source, beets are affordable, highly nutritious veggies that are available year-round. What is it good for? Beets are versatile, low in calories, naturally sweet, and packed with nutritional B-enefits. 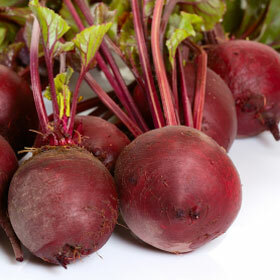 Beets are full of folate, a B vitamin crucial to healthy cell growth, especially during pregnancy. Two more B's abundant in beets: betacyanin, a pigment that is a potentially powerful antioxidant, and betaine, a heart-protective nutrient. Beets are also a great source of fibre. What does it taste like? At first sight, beetroots look rough and dirty, dusty from their time underground. But bite into a beetroot, and you may be surprised by how sweet it tastes. In fact, beets contain the highest natural sugar content of all vegetables. Eaten raw, beetroot is crunchy, but turns soft when cooked. The greens of a beet taste similar to other greens, such as chard or spinach, while the stems take on more of the sweet beetroot taste. When buying beets, look for those that have stems and leaves still attached, so you can take advantage of the entire nutritious vegetable. Look for beetroots that are smooth, unspotted, on the small or medium side, with firm roots and a deep, rich colour. You can enjoy beets raw and grated over a salad. Or you can marinate, steam, or roast them with the skins still on - though cooking may diminish some of a beet's antioxidant power. Cooked beets can be used in side dishes, main dishes, soups... The leafy greens can be sautéed with olive oil and herbs, and the stalks can be cooked right along into a pasta sauce or stew. Be warned, but don't be alarmed: If you eat too many beets, you may notice a change to the colour of your urine!